Hawaii guards Matt Gibson, Bobby Nash and Matt Lojeski help make the Rainbow Warriors a long-range threat. Can the 'Bows maintain their hot hand? 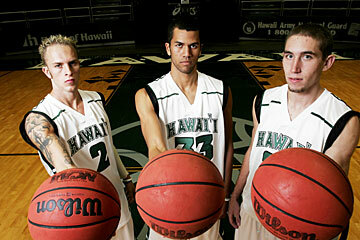 AFTER A MONTH of practice and one exhibition game, the Hawaii basketball team has shown it can fill up the net. Whether the Rainbow Warriors can continue to shoot at a high percentage once they begin a tough nonconference schedule, starting with Saturday's opener, will be a key to the team's fortunes. "We'll have to see at the start of the season when the competition really gets tough," UH coach Riley Wallace said. "But as far as practice goes, they're looking like they can shoot the ball." The question of which Rainbow will be the team's top shooter could have a different answer on a nightly basis. 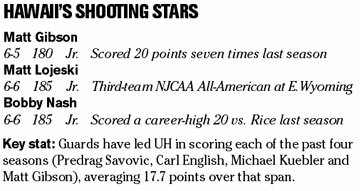 Wallace described the shooting guard spot -- UH's most productive position over the past few seasons -- as a "logjam" with a versatile trio of juniors competing for minutes. Bobby Nash and Matt Gibson return and are joined by junior college transfer Matt Lojeski, giving Wallace flexibility in searching for the man with the hot hand. "Our offense is so evenly distributed that anybody can get shots at any given time on any play," Nash said. "You just have to be ready when the time comes to hit big shots. That's why you're in here every night shooting a thousand shots a day. You hit that shot, you get hot, you stay on the court." Said Gibson: "We have three or four guys who can score 20 points on any given night." Gibson led the team in scoring last season with 13 points per game, while Nash provided some of the year's most memorable moments with dramatic 3-pointers against Oral Roberts and Rice. JC transfer John Wilder could also contribute at two-guard. "The thing with (Gibson and Nash) is they're proven," Wallace said. "Bobby's hit big shots and Matt was probably the most consistent. "(Lojeski) picks stuff up fast. Some JUCO guys don't pick things up and see the whole picture, where he's one of those special ones who seems to see everything in advance. ... The guys who can anticipate offensively and defensively become really good players." Lojeski, a transfer from Eastern Wyoming College, earned the starting spot in the exhibition game against Hawaii-Hilo and had 12 points and four assists as the three guards combined to shoot 64 percent from the field (14-for-22) and hit seven of UH's 14 3-pointers. "When all of us are shooting well, we can be real dangerous," Lojeski said. "Some nights we're not going to be hitting, but most of the time at least one of us should be shooting pretty good. "We were on, but I don't think it was luck. We work on our shot every day and I think we can maintain that and be ready to play every night." All three can also contribute at other positions. Nash has played both guard and small forward in his career and Lojeski spent most of the preseason at forward before concentrating on the guard spot. Gibson played point guard down the stretch last season. Gibson spent the summer in the weight room, putting on 10 pounds to prepare for the grind of the season. He said the team's 16-13 mark a year ago fueled his offseason efforts. "I improved my game and I'm working hard," he said. "Our record last season was my motivation." The group also gives the Rainbows size in the backcourt, with Gibson at 6-foot-5, Lojeski at 6-6 and Nash at 6-6, and Wallace would like to see them crash the boards as well. "As long as I'm on the court, helping my team to win, there's nothing more you can ask for," Nash said.